I’m so close to finishing Miss Hitchens’ Whimsy … I can hardly believe it. I’ve calculated just four evenings of stitching will complete the remaining two small corner blocks. 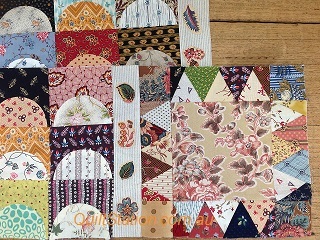 Miss Hitchens’ Whimsy corner block…two down, two to go. Miss Hitchens’ Whimsy outer borders. …and the centre is done. Centre block…FULL of Broderie Perse. It is such a *good* feeling. 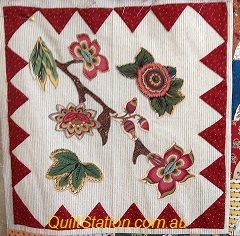 So that is the first of the three quilts that are in the *Priority Pile*. 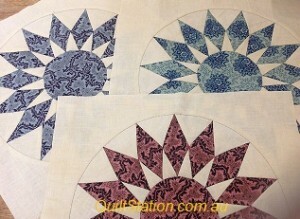 The second is the 1800s Sunburst Quilt…maybe progress is too specific a word for this. Chugging, nay Plodding along might be more apt but I am getting there and I periodically have another finished block to admire. I still get a thrill out of finishing one and deciding “which one next?” At the moment I seem to be drawn to these Vermiculate style patterns. Once MHW is finished I’ll be able to get a bit more gung ho with these blocks. 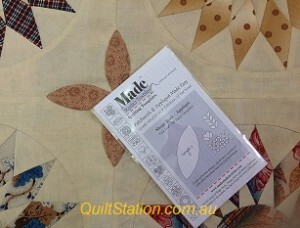 And I’ve decided to use these Leaf Templates from Made Studio for the elipse corner applique…I’ve used these before and really like the accuracy and speed of these ready made templates. Prussian Blue Ombre by Pam Weeks and Eccentric print by Lisa DeBee Schiller. I’m itching to start sewing again on this… But first I’m going to prepare those last two MHW blocks…today. I hope you are enjoying your UFO’s too. Great post, I always enjoy seeing what you are working on. They are all going to be beautiful! Never a free moment for people like us. 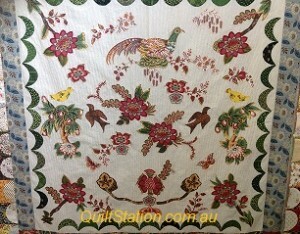 Wonderful projects Margaret – so inspiring!! Miss Hitchins is beautiful – going to be a great workshop there. 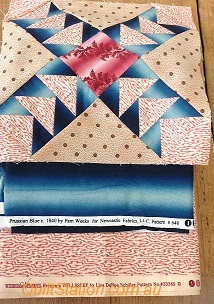 Love the fabric selections in the other two as well – just divine! I have some of that blue ombre and sneak it into as many projects as I can. 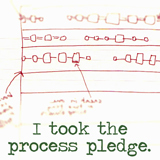 It is always so exciting to see what you are working on – thanks for sharing your progress. 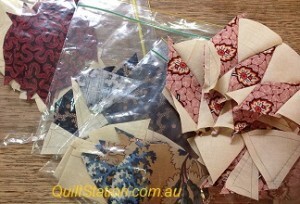 You have some beautiful quilts in the works. Just lovely. I love all of the different borderie perse pieces. Can’t wait to see them all finished.